This new commentary by Sister Aquinata Böckmann discusses the Prologue and chapters 1, 2, and 3 of the Rule of St. Benedict. In a lectio regulae she plumbs the depths of Benedict's vision. Listen, the first word of the Prologue, is a keyword that describes the main stance of the individual monastic, the superior, and the entire community. Listening to the Scriptures and in them to Christ guides individuals and the community on how to "run on the way of God's commandments" toward the goal of communal life in and with Christ. 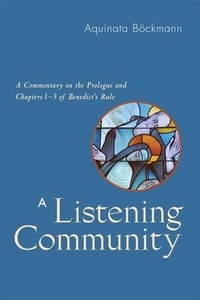 The first three chapters of the Rule concretize the principles of this communal spirituality of listening: the importance of a rule and a pastor for maintaining the community's attentiveness to life; the superior's responsibility to listen to individuals within the community; and the mutual listening between leader and community members, regardless of their age. As in her earlier books Sister Aquinata proves to be a true guide into the spirit of Benedict's Rule, which provides sound principles for listening in common in a community of life.